Hello, so the first week of 2017 is over. That’s one week down, 51 to go. The holidays are over. And for the first time probably ever, I was so ready to say goodbye. My birthday is the week before Christmas, so I have more stake in the Christmas season than most. But this year, this year was so different. Both my husband and I talked about how much we loved Christmas this year. Our son is the perfect age where he starts to get the fun and tradition in it, but not old enough where he was caught up in the Hatchimals craze or had any expectations really. Oh, but the exhaustion. The holiday drag is real. My husband had the whole week between Christmas and New Year off from work, so we pushed ourselves and that included pushing our newborn. Don’t tell him this, but I was ready for him to go back to work. Not because I didn’t like spending time with him- I do, oh, so much. My goodness though he wants to go, go, go while he’s on vacation. I want to stay, stay, stay. We are both homebodies, but he is less so because he spends five days a week at a desk. So I get it, but I don’t love it. So he went back to work, as did the rest of the world. All went back to normal, and I exhaled for the first time in two weeks. Our mornings slowed down, but so did the afternoons. All time slowed down until 7:00pm. Then I pulled out the wine and chocolate, and all of a sudden the evening seems to double time. So how do we do this? How do we get out of the holiday rut? This isn’t about resoltuions or goals. This is just about how we got back to our life once all the candy canes had been eaten and the wrapping paper had been put away (I see you 90% off sale at Target!). Say hello to routine. I love, love, LOVE routine. So the holidays are sort of like a slow motion train crash to me. No one else in my family seems to understand that I need to plan things way ahead and stick to it. But that’s for another blog post. Next week we are continuing our activities like our Bible studies and library storytimes. Boom! Structure. That means that by naptime, my toddler is ready to take a break from his fun. That means I get a break in the middle of the day. What mom doesn’t crave that? The most valuable thing I do to recover from the post holiday blues is to find something new to focus on. Shift my focus to something that makes me feel like a human and not a Christmas elf. This year my focus has shifted to reading and blogging. Miss the Christmas songs- sit down with a book. Tonight I was feeling extra blue, so here I am typing away on my computer. Are you still feeling blue? 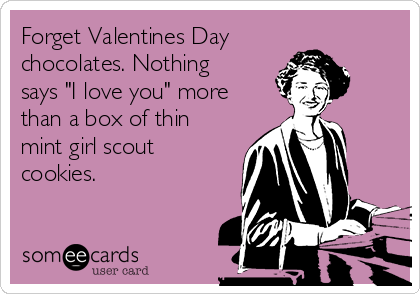 You can always decorate because there is always a holiday on the horizon; Valentine’s Day is only 37 days away, but right now it’s Girl Scout cookie season!